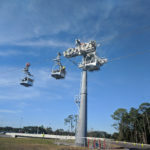 Walt Disney World guests might have noticed testing underway for the Disney Skyliner this past week. 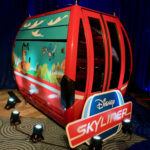 The Skyliner is scheduled to open at the Resort this fall. The Disney Parks Blog officially announced today that Disney Skyliner has indeed begun its initial testing. The Skyliner’s towers have been under construction for about a year and this week, testing with the gondolas is now underway. Jordan Matthews of Walt Disney Imagineering was featured in a new video talking about the project and gondolas. 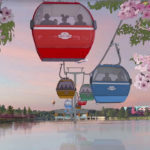 Several gondolas will be adorned with graphics based on Disney films, attractions and characters. Guest may jump into a gondola where from the ground it will look like Mickey Mouse, Minnie Mouse, Pluto or Chip & Dale are riding along with them. 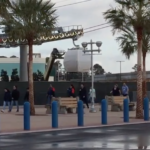 Last week a Disney guest shared a video of the gondola testing at Disney’s Hollywood Studios. For more information, pictures, and videos of the Disney Skyliner, check out our Laughing Place Project Tracker.